Researchers at the University of Georgia have developed an inexpensive way to manufacture nanofibers. The new method, dubbed 'magnetospinning,' provides a very simple, scalable and safe means for producing very large quantities of nanofibers that can be embedded with a multitude of materials, including live cells and drugs. Researchers at the University of Georgia have developed an inexpensive way to manufacture extraordinarily thin polymer strings commonly known as nanofibers. These polymers can be made from natural materials like proteins or from human-made substances to make plastic, rubber or fiber, including biodegradable materials. The new method, dubbed "magnetospinning" by the researchers, provides a very simple, scalable and safe means for producing very large quantities of nanofibers that can be embedded with a multitude of materials, including live cells and drugs. Many thousands of times thinner than the average human hair, nanofibers are used by medical researchers to create advanced wound dressings--and for tissue regeneration, drug testing, stem cell therapies and the delivery of drugs directly to the site of infection. They are also used in other industries to manufacture fuel cells, batteries, filters and light-emitting screens. "The process we have developed makes it possible for almost anyone to manufacture high-quality nanofibers without the need for expensive equipment," said Sergiy Minko, study co-author and the Georgia Power Professor of Polymers, Fibers and Textiles in UGA's College of Family and Consumer Sciences. "This not only reduces costs, but it also makes it possible for more businesses and researchers to experiment with nanofibers without worrying too much about their budget." Currently, the most common nanofiber manufacturing technique--electrospinning--uses high-voltage electricity and specially designed equipment to produce the polymer strings. Equipment operators must have extensive training to use the equipment safely. 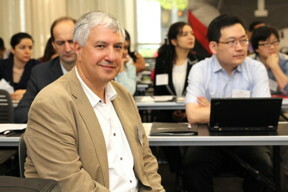 "In contrast to other nanofiber spinning devices, most of the equipment used in our device is very simple," Minko said. "Essentially, all you need is a magnet, a syringe and a small motor." At laboratory scale, a very simple handcrafted setup is capable of producing spools containing hundreds of yards of nanofibers in a matter of seconds. Polymer that has been melted or liquefied in a solution is mixed with biocompatible iron oxide or another magnetic material and placed inside a hypodermic needle. This needle is then positioned near a magnet that is fixed atop a spinning circular platter. As the magnet passes by the tip of the needle, a droplet of the polymer fluid stretches out and attaches to the magnet, forming a nanofiber string that winds around the platter as it continues to spin. The device can spin at more than 1,000 revolutions per minute, enough time to create more than 50 kilometers--or about 31 miles--of ultra-thin nanofiber. It's a relatively simple process, but it produces a very high-quality product, said Alexander Tokarev, paper co-author and postdoctoral research associate in Minko's lab. "The product we can make is just as thin and just as strong as nanofibers created through other methods," he said. "Plus, users don't have to worry about the safety issues of using high voltages or the complexity of other machines." "We can use almost any kind of polymer with this platform, and we can tailor make the nanofibers for different applications," Minko said. "It's like cooking. We just change the ingredients a bit, and the kind of fiber we get is very different." The University of Georgia Research Foundation Inc. has filed a patent application on this new method.